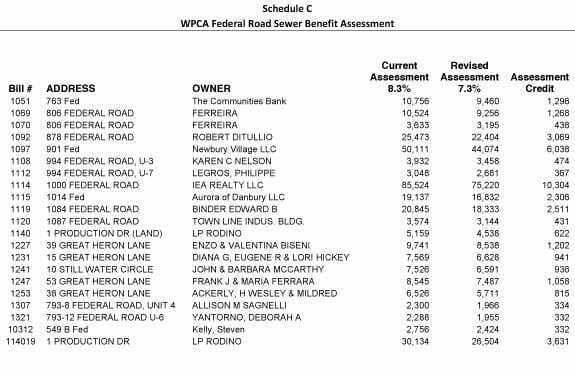 The Federal Road North District pump and piping system was installed in 1992 and the “Benefited” properties subsequently assessed the following year to pay off a 28 year bond of $3.4 million. Over the course of the last 20 years, the bond obligation has been paid by the original properties. Any new properties that have been hooked up in this district since 1993 have also been assessed. 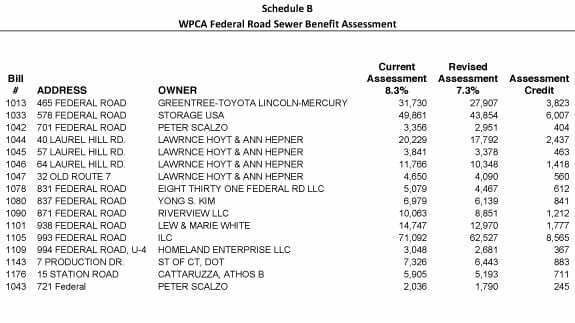 State Statues allow the WPCA to collect the necessary bond obligation amounts, plus any repairs and upgrades to a sewer district. Since the WPCA is not a taxing authority, the program is not allowed to over-collect. Subsequently, from time to time, it is necessary to adjust the rates downward so the assessment revenue stops when the bond obligation stops and not before. The original assessment rate was 9.3% of the Grand List value of all properties at the assessment year of 1992. At that time the last previous town wide assessment was 1983. Consequently, the assessment of new properties is based on what the value would have been in 1983. The 1983 values are determined using government issued construction cost indices to determine actual amounts in current dollars. This way all properties are assessed on the same basis. In 2007, the assessments were reduced to 8.3% of the 1983 Grand List value with the addition of Newbury Village in this Federal Road North district. In January 2012 the assessment rate was further reduced to 7.5% of the 1983 Grand List value. The Resolution can be downloaded as a high quaity pdf file or simply viewed below. The rate was further reduced once again for the June 2015 billing again to 4.65% of the 1983 Grand List Value. This is the current rate now applied to existing customers with a balance due and new customers for projects then under construction, such as Oak Meadows, Riverview, Newbury Village and properties now existing and planned at the Four Corners.